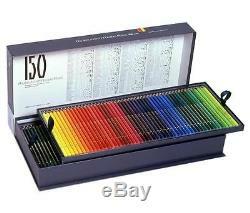 Holbein Artist Colored Pencil 150 colors SET OP945 paper box. Holbein Artist Colored Pencil 150 colors SET. Holbein's Colored Pencil for ArtistsA total of 150 colors. It is the colored pencil that the lead kneaded with pigment, wax, fats and oils, etc. Is dried and put in the thin central canal of an axial pencil frame of wood. Holbein's Artists' Colored Pencil made from carefully selected fine pigments is a soft oil colored pencil; therefore, it is adjusted to meet artists' high demands. As color material, it enables you to paint rapidly necessary colors one after another without soiling the hand. Color spreads well, for the lead is soft. It can be used for daubing the whole surface of paper uniformly with a thick lead and also for drawing fine lines smoothly with a tapering lead. Excellent light resistance High-grade pigment is selected carefully, and it exhibits little fading or discoloration by light. Thick lead and thick pencil easy to draw with The lead 3.8 millimeters in diameter is thick enough to paint wide area at a time. The pencil 7.8 milliliter in diameter is easy to hold and thus the hand drawing is not so exhaustive. Able to draw on watercolor, gouache, and acrylic color It can be used together with watercolor or acrylic color, for it fixes well to any kind of paper. Able to paint like watercolor painting with Meltz You can paint a picture with the colored pencils in advance and dissolve and gradate it with Meltz. Then the completed picture looks like watercolor painting. W460 × D200 × H50mm. I cannot bear that knids of charges. We cannot accept customer cancellations and changes to orders after an order has been finalized. Rice, and quantity before completing your order. As long as you have not used them. The arrival of your goods. After we have verified which parts were defective, we will notify you of how we will proceed. 1 Products you have had in your possession for 15 or more days from arrival. 2 Products that have been used. 3 When the condition of the product differs greatly form the condition upon arrival to you (including boxes and any accessory items). Small imperfections in paint or parts on your item. These are naturally occurring inconsistencies. Caused by the mass-production process and are not considered defects. Following is a breakdown of the amount that we will reimburse you. If you are satisfied with this item, I would be very pleased. I would like to offer you a good quality item. If you can not find the item you are looking for, Please feel free to ask me! Certain images/photos are the copyrighted property of JupiterImages and are used with permission under license. Show off your items with Auctiva's Listing Templates. Attention Sellers - Get Templates Image Hosting, Scheduling at Auctiva. The item "Holbein Artist Colored Pencil 150 colors SET OP945 paper box" is in sale since Thursday, January 12, 2017. This item is in the category "Crafts\Art Supplies\Drawing & Lettering Supplies\Art Pencils & Charcoal". The seller is "machi1497" and is located in Saku,Nagano. This item can be shipped worldwide.